We just love this bubble for little girls made by Le Za Me. 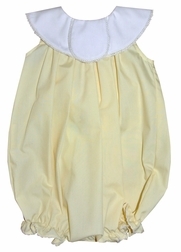 It is made in a soft yellow fabric and has a white round collar. 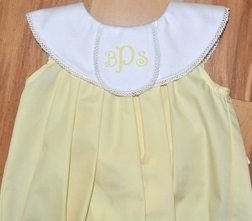 The collar is called a "hand me down" because it has an oval tab that you monogram for the first baby and when you pass it down, the tab folds back and under the collar itself and you monogram the actual collar with the next baby's initials. Fabulous idea!! 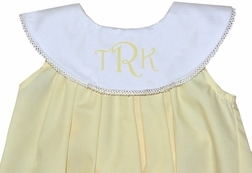 It is monogrammed with your little one's 3 initials in yellow.